Little Red Riding Hood promised to be careful, then saying good-bye to her mother she set off. Her grandmother lived in the forest, and it was a long walk from the village. On the way, the little girl met a wolf. She didn't know what a wicked animal he was so she wasn't at all frightened. ''Good morning Little Red Riding Hood,'' said the wolf. 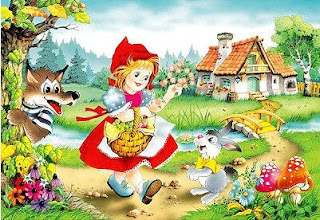 ''Good morning,'' replied Little Red Riding Hood, politely. ''What a choice morsel this plump little girl is!'' thought the wolf. Little Red Riding Hood looked up and saw the sun's rays shining through the trees and pretty wild flowers growing everywhere. ''My grandmother would like a bunch of these, ''she thought. ''It's not late, I've plenty of time.'' So she left the path and skipped off into the undergrowth. As soon as she had picked one flower, she saw another, even prettier further on, and went to pick that too. Without realizing it, she was wandering deeper and deeper into the forest. Mean while, the wolf ran straight to the old lady's house and knocked at the door. ''I'm too weak to get up. Just lift the latch,'' Grandmother called out. The wolf lifted the latch and went in. he ran straight over to the old lady's bed and ate her up. Then he put on her night-dress and lace night-cap and got into her bed, drawing the curtains round it. ''Good morning, Grandmother!'' There was no reply. She drew back the curtains and saw her grandmother lying there with her lace night-cap pulled right down to her eyed, hiding nearly all of her face. ''Oh! Grandmother, what big ears you have,'' she said. ''All the better to hear you with, my child!'' replied the voice beneath the night-cap. ''All the better to eat you with,'' cried the wolf and he leapt out of bed and swallowed Little Red Riding Hood whole. Then feeling rather full, the wolf climbed back into bed and started to snore. He went into the bedroom and saw the wolf fast asleep in the bed. ''What if the wolf has eaten the old lady?'' He put down his gun, took out a pair of scissors and started cutting open the sleeping wolf's stomach. At the third snip Little Red Riding Hood jumped out. ''Oh what a fright I've had! It was so dark inside the wicked wolf!'' she cried. Then her grandmother appeared, still alive, but scarcely able to breath. The huntsman had arrived just in time! Everyone was very happy. The huntsman took the wolf skin and went home. Grandmother ate the cake and drank the elderberry wine that her granddaughter had brought her and felt much, much better. Little Red Riding Hood said nothing, but promised herself that she would never wander from the pathway to play in the forest, ever again. Once upon a time there was a little girl who lived with her mother at the edge of a deep, dark forest. Everyone called the girl ''Little Red Riding Hood'' because she always wore a bright red cloak with a bright red hood. ''I will,'' replied Little Red Riding Hood. Little Red Riding Hood hopped and skipped along the path to Granny's house. She had only gone a short way into the deep, dark forest, when a sly, nasty wolf with big shiny teeth and long sharp claws jumped out onto the path, right in front of her. 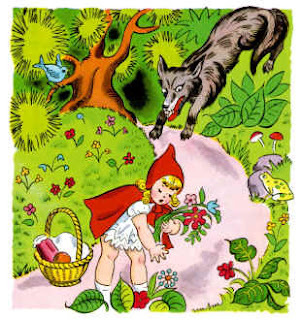 So, while Little Red Riding Hood picked a bunch of sweet-smelling flowers, the wicked wolf raced ahead through the deep, dark forest and soon arrived at Granny's cosy cottage. The wolf lifted the knocker and banged hard at the door. Granny sat up with a start. ''Who is it?'' she called. ''It's me, Little Red Riding Hood,'' replied the wolf in a soft voice just like Little Red Riding Hood's. So the wolf opened the door and, quick as a flash, he gobbled Granny up. Then he put on her nightgown and nightcap, and crawled under the covers to lie in wait for Little Red Riding Hood. A short time later, Little Red Riding Hood arrived at the cottage and knocked on Granny's door. ''Hello, my dear,'' called the wolf. So Little Red Riding Hood lifted the latch, opened the door and went into Granny's cottage. Little Red Riding Hood couldn't believe her eyes. Little Red Riding Hood took a step closer to bed. So Little Red Riding Hood took another step closer. Now she was right Granny's bed. ''What big teeth you have! ''All the better to eat you with my dear!'' snarled the wolf, and he jumped up and swallowed Little Red Riding Hood in one BIG gulp! 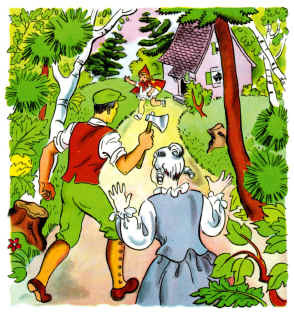 Now it just so happened that a woodcutter was passing Granny's cottage that day-he was on his way to work on the other side of the forest. He knew that Granny had not been feeling very well, so he decided to look in on her. What a surprise he had when he saw the hairy wolf fast asleep in Granny's bed! When the woodcutter saw the wolf's big, fat tummy, he knew just what had happened. Quick as a flash, he took out his sharp, shiny axe and sliced the wolf open! Out popped Granny and Little Red Riding Hood. surprised and shaken, but safe and well. The woodcutter dragged the wolf outside and threw him down a deep, dark well so he would never trouble anyone ever again. Then he, Granny, and Little Red Riding Hood sat down and ate all the lovely, Yummy goodies that were in Little Red Riding Hood's basket. A little while later, Little Red Riding Hood waved goodbye to her Granny and the woodcutter and ran all the way home to her mother. And she didn't stray once from the path or talk to any strangers. All rights reserved Copyright © 2013/2018 Goodreadingfor.blogspot.com. Awesome Inc. theme. Powered by Blogger.